Oh my gosh! It’s been months since I’ve posted! 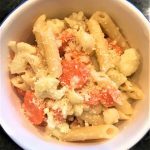 I vowed to myself that I’d stop commenting on that and just let this blog be what it is – a collection of my recipes – with no strict rules of how often and when I post. But, it still bugs me when I go this long without posting because I truly enjoy these posts and I have tons of recipes to share! 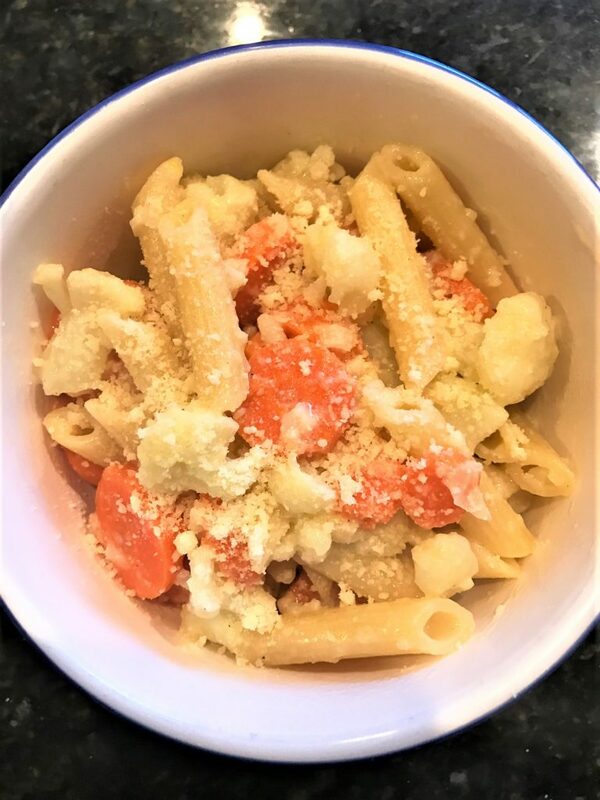 I made this vegetable and pasta dish last week when my wife was really under the weather. She was hit with strep throat and was craving some healthy-ish comfort food. I took a look in the fridge and saw the carrots and cauliflower. 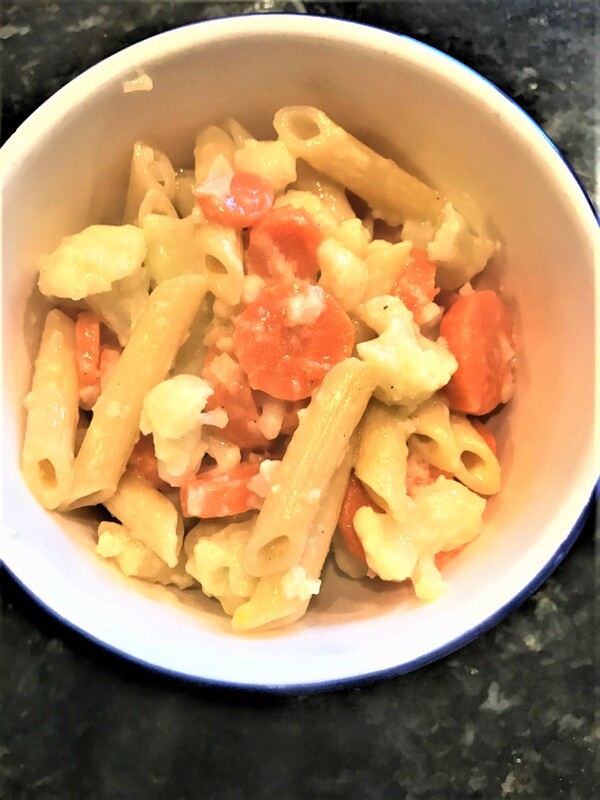 At first I thought, you don’t often see those two vegetables in pasta dishes, but it turned out to be a really delicious combination! I made a quick butter, garlic and cheese sauce and dinner was served! I love when dishes like this come together. I had no intention of cooking that night so I love when I’m forced to use the ingredients on hand in a creative manner. This dish is a great one to add to your weeknight dinner routine! Fresh out of the pot and just before I hit it with a little extra Parmesan garnish. Never enough cheese! Bring a large pot of water to boil over medium-high heat. Once boiling, add about a teaspoon of salt. Once the water returns to a boil, add carrots and cauliflower. Cook for 5 – 6 minutes until vegetables are softened but not mushy. Drain and set vegetables aside. Bring pot of water to boil again, adding a teaspoon of salt once it is boiling. Once the water returns to a boil, add pasta. Cook according to package instructions, about 8 – 12 minutes for al dente. In a large pan melt butter over medium heat. Once butter is melted, add garlic. Saute garlic for 1 – 2 minutes until softened being careful not to let it brown. Season with 1/2 tsp. of salt and 1/4 tsp. of freshly ground black pepper. Saute for 2 minutes. Add milk and pasta. Toss well until some of the milk is absorb into the pasta. Add Parmesan cheese and toss again. Remove from heat, garnish with additional Parmesan cheese and serve immediately.